Over the past 60 years, a truly staggering array of devices have been used to do one thing: convert computer information into a visual readout that's meaningful to a human operator. This section is a collection of various approaches to achieving that goal. Before the invention of the Nixie tube, manufacturers came up with various clumsy ways to display numeric data electronically. This Beckman counter module shows one popular solution, output is displayed on a row of ten neon bulbs behind a digit shaped mask. Counting is performed by four 5963 tubes wired into a binary counter circuit, which drives the individual neon bulbs. The 5963 tubes are not present in this example, but in normal operation would have been plugged into a row of sockets in the rear of the module. 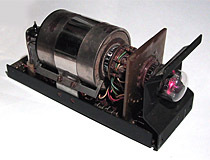 Though somewhat bulky in appearance, these modules have enjoyed modest popularity among modern day collectors as they can be used to build reasonably accurate all-tube counters with little effort, and are much better documented than the rather more attractive beam switching tube counters shown below. This device is a plug-in single stage adder utilizing a 'Dekatron' glow transfer counting tube for display and counting functions. 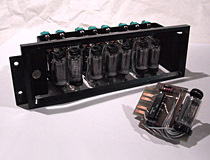 The installed tube, a Baird Atomic 6476A, is a 4kHz neon filled selector which brings each of its ten outputs out to a separate pin. Each output pin is brought to a plug connector on the back of the device, allowing the position of the counting tube to be read by external devices. This module also contains a single an RCA 2N270 transistor, a rather out-of-place component to reside in a tube based counting module. 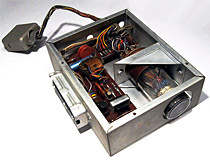 The DC106A is an all-tube decade counter module manufactured by Burroughs. The core of the device is a BD-301 magnetic beam switching tube, which uses a hollow cylindrical magnet to guide an electron beam around a ring of target electrodes in a controlled sequence. The magnetic beam switching tube directly drives a B-5092 nixie tube, which displays the current value by ionizing number-shaped cathodes. 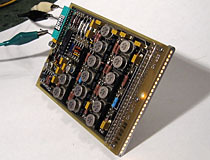 The interface and control hardware consists of a 5963 and a 6189 (both computer-rated dual triodes), several neon bulbs, and a large matrix of resistors and capacitors. The entire module appears bulky to the point of being ridiculous; nonetheless it was a significant improvement, both in speed and readability, compared the 'dekatron' style glow transfer counters it was designed to replace. 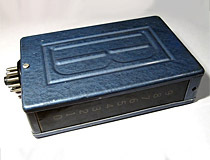 The Van Norman Industries CP-468/U counting module is an obscure magnetic beam switching tube counter, which is dominated by a large Burroughs BD-301 ten position counting tube installed prominently in the center of the device. Magnetic beam switching tubes are complicated vacuum devices, which contain a ring of targets surrounding a central electron beam that can be 'bumped' from target to target with controlled pulses. Such tubes are vulnerable to external magnetic fields; the BD-301 tube used in this device is protected by a large cylindrical mu-shield to block external magnetic influence. This module also has two unpopulated 9 pin tube sockets, both marked for 5814A tubes, as well as a number of passive components on a PCB mounted below the magnetic beam switching tube. 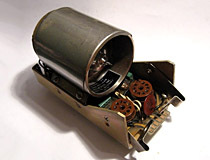 This module is rated for a maximum counting speed of 100khz and has a front mounted 12 pin edge connector for attachment of an external Nixie tube display. The AD206B is a base-ten counting module which makes use of a Pinlite DIP650 minitron-style incandescent readout for digit display. The AD206B is built around a Texas Instruments 74144, a 4 bit TTL counting IC with an integrated 7 segment driver. 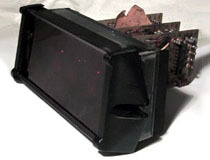 Most of the 74144's functions are brought out to a 14 pin connector on the back of the device, which also supplies power for the minitron display. The use of a minitron allows for an exceptionally simple circuit to be used, since the cathode resistors typical for a LED 7 segment readout are not needed. The Pinlite DIP650 mounted to the front of the display is a rather clumsy device however... the DIP650 uses the same envelope and display elements as the much smaller Pinlite MD650, but mounts these in a bulky plastic enclosure in order to provide a traditional DIP pin layout. 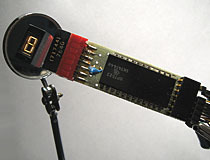 Manufactured by Dialco, this archaic-looking device is an early example of a single digit LED display module using a tiny FND-10 LED display. An attached PCB includes a 7448 BCD to 7-segment decoder and current limiting resistors. FND-10 displays are so small as to be practically unreadable; in an attempt to counteract this, Dialco has mounted a large removable magnifier on the front of the module. 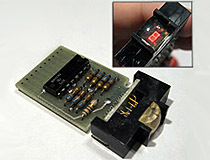 A rare part indeed, the MDA111 is a first-generation fully alphanumeric LED display module. The heart of the MDA111 is the Mostek 2302, a six-bit character generator ROM in which all of the bitmaps for the ASCII characters have been encoded. The 2302 drives a Monsanto MAN-2 5x7 bitmapped LED display, which is generally considered to be the first 5x7 LED display made available to the public. A constellation of transistors interfaces the MAN-2 to the 2302, and several other integrated circuits provide clock and buffering logic. 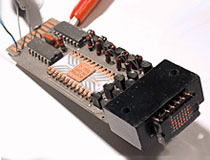 The market viability of such a complex device was short lived; within a few years displays like the HPDL-1414 became available, in which the complex driver electronics of the MDA111 have been condensed into a single die and incorporated into the diode package itself. This is an 8422-based display which resembles the more common BIP-8404 display module, but with Hyde Park decoder boards (7441 TTL) instead of transistor drivers like the Burroughs modules of similar configuration. Examples of this display may be equipped with Burroughs 8422 / B-5991 nixies, or with National 5991 equivalents. This is a modular TTL-driven display with Burroughs B5870 side-viewing nixies. Each nixie is mounted on its own removable card with an attached 7441 driver IC. The source of this module is unknown, but it most likely was removed from a frequency counter or voltmeter. The tubes are soldered directly to each card... when a tube fails, the entire card must be replaced.